Drug-free pain relief for you and baby, don't let your baby be born drowsy! Highly recommended by midwives and WHICH? TENS labour and obstetric machines are widely used during childbirth here in the UK. Designed by UK Specialists Verity Medical, the Neurotrac Labour Obstetric TENS is suitable for Obstetrics and Labour pain relief. The NeuroTrac Obstetric TENS is a digital dual channel Obstetrics TENS unit. It has 1 dedicated labour pain programme for ease of use. The NeuroTrac Obstetric TENS comes with its own specially designed Remote Boost Switch for additional pain control at times of intense pain. It is user friendly, compact, light and reliable; which is exactly what you need during labour! How does the NeuroTrac Obstetric Labour TENS machine work? The NeuroTrac Obstetric TENS Stimulator uses four long skin electrodes on the skin close to the spine, connected to the device via lead wires. The stimulation intensity can be adjusted until a mild tingling sensation is felt. 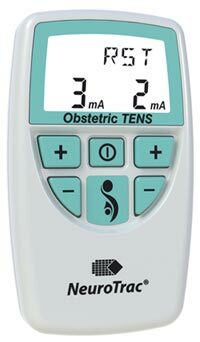 The NeuroTrac Obstetric TENS unit has a hand held Remote Boost Switch control to change the stimulation mode from LOW frequency burst to HIGH frequency stimulation. The low frequency is used during rest periods between contractions. As soon as labour contraction is felt strongly the mode can be changed to high frequency stimulation using the Remote Boost Switch. Once the contractions have subsided the mode can easily be switched back to low frequency burst mode stimulation. Clinical evidence suggests that to achieve the best pain relief, the stimulator should be used from the first onset of labour pain and for two to three hours after birth. If it is found that insufficient pain relief is achieved with the NeuroTrac Obstetric TENS unit, improved relief can be achieved by using smaller amounts of alternative analgesia to compliment the TENS unit. From existing evidence, obstetric TENS units can be an effective technique for pain control in over 80% of births with no side effects. Amplitude: 0-80 mA into 500 Ohm load; indication only. Constant Current, maximum output voltage 180 Volts +10 / -30 Volts. Waveform: Asymmetrical, rectangular bi-phasic with zero DC current. Mode: Continuous (Boost mode). Burst mode: Bursts of 9 pulses [200 μS] at 150 Hz, repeating twice every second (Rest mode). If the battery goes below 6.9 volts +/- 0.2 volts the battery symbol will flash on/off once every second. If the battery voltage is below 6.6 (+/- 0.2) volts the unit will not turn on. What do I get with the Verity Medical Labour TENS machine? The NeuroTrac Obstetric TENS unit comes with the Remote Boost Switch, a set of four electrode pads, the lead wires to connect the electrode pads to the unit, a 9v battery and a handy storage NeuroTrac bag. As well as the Operators Manual, containing all the information needed about the unit and programmes, also included is the Electrode Placement Manual, guiding you through which electrode pad shapes and sizes to use, and where to place them to achieve the best results. The NeuroTrac Labour TENS offers a background level of pain relief to which other pain relief methods can be added, (epidural etc. if medical intervention is required) although some mothers use only TENS throughout their labour. The beauty of TENS during your labour? There are no harmful side effects and as a result your baby will be born more awake and responsive, unlike those whose mothers have used strong drugs for pain relief. The NeuroTrac Obstetric TENS machine can also be used after your labour to help with post-labour pain relief. A drug-free labour allows for quicker bonding between you and your baby and consequently breastfeeding difficulties are less likely. Labour TENS can be used from 37 weeks of pregnancy onwards. Earlier use should be discussed with your obstetrician. The electrodes should not be placed on your abdomen at any time during pregnancy or labour but on your back by your spine. When you get a contraction, press the boost button and this will prevent the 'pain' signal from reaching your brain – it’s a simple solution to the problem of labour pain. Simple to use the sticky pads (TENS electrodes) attach easily to your skin, you will feel a pleasant pulsing sensation, and this helps to raise the levels of your own pain relieving chemicals endorphins which naturally fight the pain. Clinical evidence suggests that to achieve the best pain relief during labour, the NeuroTrac Labour TENS machine should be used from the first onset of labour pain and for two to three hours after the birth of your baby/ies. If it is found that insufficient pain relief is achieved with the NeuroTrac Labour TENS unit then, improved relief can be achieved by using smaller amounts of alternative analgesia to compliment the labour TENS machine.